It takes just 5 mins to get the hang of it, but once you do, you won't want to live without it. The admin aspect is incredibly basic, and doesn't bog you down. The paid version is well worth the price. We couldn't be happier. It really is the very best chat app I've tried. By simply collecting an email to start the chat, they can tell you what the customer has in their existing cart, their order history, their chat history, and more. This is such an obvious and useful feature, it's surprising I couldn't find it anywhere else. Making your customers happy has never been this easy! HappyFox Chat gives you a snappier live chat experience with amazingly fast response times and in-context conversations making every chat a delightful, gratifying experience for your customers. Be on the same page. Always. Understanding your customers have never been more easy. 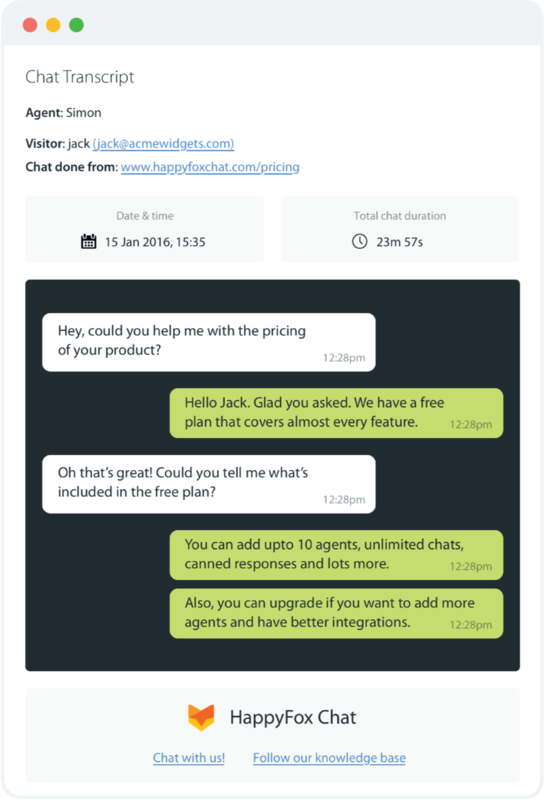 With HappyFox Chat, you know everything about a customer, even before you’ve started a chat. Their previous conversations, shopping preferences and more. Offer a customized experience and be on the same page in every conversation, with your customer. No more asking the same question again on every new chat. With HappyFox Chat, you know every customer's previous conversations, where they left and where they're headed. Continue the conversations, every repeat visit. Delight them, be their hero! With HappyFox Chat, it's easy as never before to make sense of each chat conversation. HappyFox Chat gives you all the data and metrics you need to measure and analyze what happened with each conversation. Learn, review and get better at support with every chat! 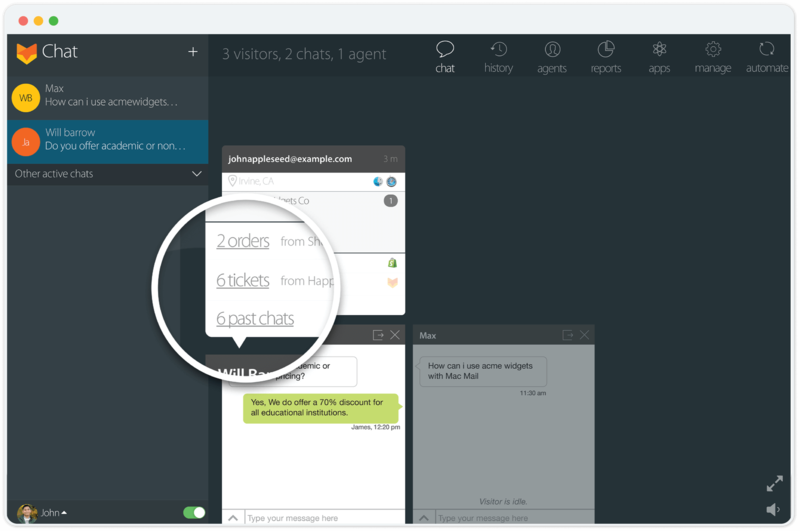 With integration between live chat and sales CRMs, HappyFox Chat makes it easy and powerful than ever before to bridge the gap between support and sales teams. Be exceptional at support and win more sales offering a great customer experience - all at the same time! With beautiful chat transcripts sent to your customer after chats, ensure they know what the next steps are or how their questions were answered. Finish off great support conversations by adding little bit of clarity to them. A little bit goes too far!